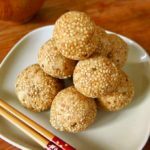 As you travel throughout Asia, you realize that you can feast on these fried sesame balls in many countries. I remember the street vendors, installed most of the afternoon at a street corner, and offering these sweets, fresh and still hot. 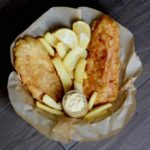 Their envelope is crisp on the outside, soft and slightly elastic on the inside, with the toasted sesame taste coming out at every bite. 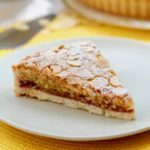 As you bite into it, you reach a delicately sweet and floury filling that perfectly complements the fried dough. I could not help but order them each time! They have a different name based on their origin but today, we will call them by their Khmer name: num kroch (or nom kroch), which means cake (num) orange (kroch) because its shape is reminiscent of the fruit. Cambodian num kroch is said to have originated in China where it is called jian dui or sometimes maqiu. The Chinese probably exported it as they migrated to Asia. 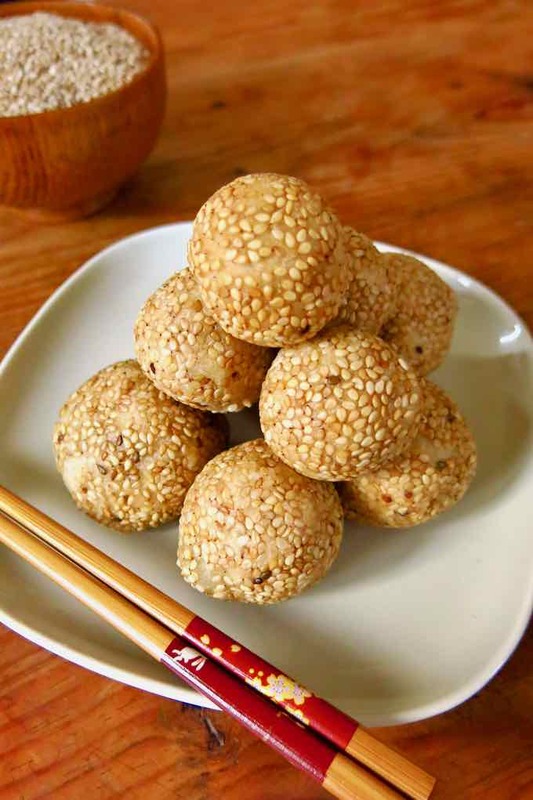 Thus, these glutinous rice balls with sesame are popular in Vietnam, Cambodia, Laos and Thailand. There are also variants in Japan, Korea, Malaysia, Indonesia and the Philippines. The stuffing of num kroch is made of mung beans while in China, it can be based on lotus paste, black or red beans or black sesame. The slight swelling of the dough during cooking creates a hollow center between the envelope and the stuffing. The composition of the envelope can also vary: sometimes it only consists of glutinous rice flour as in China, or it can also include ordinary rice flour as in Cambodia or potato as in Vietnam to provide softness. 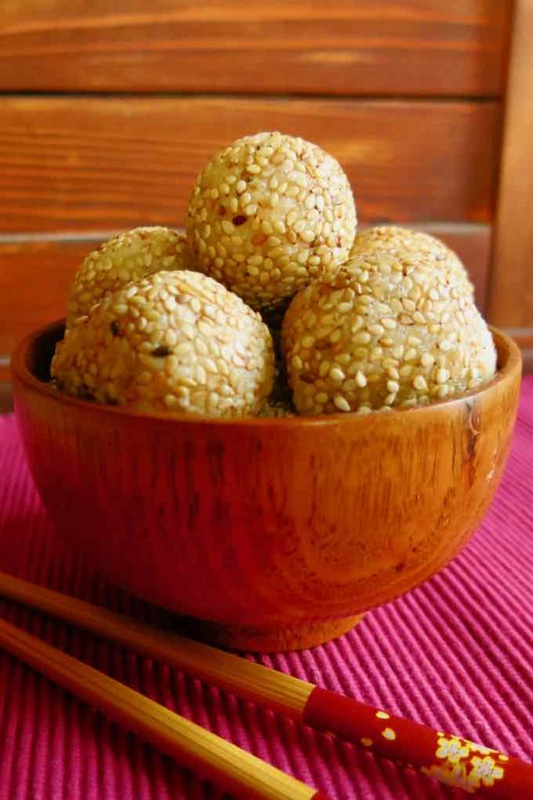 In Vietnam, these sesame balls are very popular. North and South Korea each have their version, respectively bánh rán (fried cake) and bánh cam (orange cake). 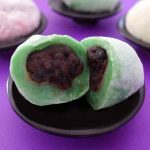 Both variants, stuffed with mung bean paste, are very similar. Bánh rán is perfumed with jasmine and just like the num kroch, the stuffing is separated from the envelope. The Japanese version is called goma dango and is often served on skewers. 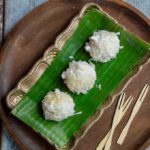 In Indonesia, it is called klepon and in Malaysia onde-onde, both filled with palm sugar and covered with grated coconut, which are similar to num kroch. The envelope of the num kroch is composed of glutinous rice flour, which gives it this slightly elastic texture. It is better to talk about glutinous rice or sweet rice because we should not confuse this variety of rice (Oryza sativa L.) with other varieties that become more or less sticky and viscous when cooked. 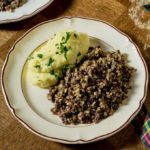 The glutinous rice grain remains firm but it sticks together while cooking, which makes it possible to eat it by forming small balls with the fingers. 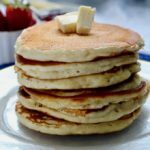 Its high content of amylopectin, a component of starch, is responsible for this “sticky” characteristic. Contrary to what its name implies, glutinous rice does not contain gluten. It is one of the staples of Chinese and Southeast Asian cuisines, where it has been cultivated for nearly 4000 years. 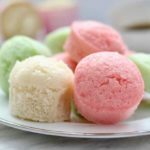 Glutinous rice flour is used in particular to make desserts. Anecdotally, in China, glutinous rice has been used as a mortar for over 1500 years. Indeed, by associating it with lime, you can obtain a compact material that is much more resistant than conventional mortar. It was notably used to seal the bricks of the Chinese wall! 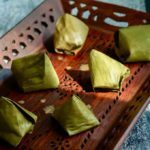 In Cambodia, num kroch are stuffed with a preparation of mung beans. This plant of the fabaceae family is also known as green gram. It is originally from the Indian subcontinent. Its seeds are germinated to obtain the famous “bean sprouts”, widely consumed in Asia. 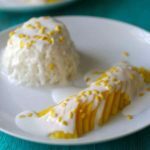 Like most Asian desserts, num kroch are not very sweet. Mung bean paste should not be too dry either. 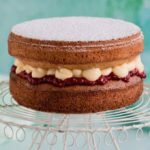 It can be made in advance and kept in the fridge for 3 days. To prevent the balls from exploding during cooking, the cooking oil should not be too hot. I recommend to heat at around 280 F.
To taste them the Asian way, flatten them to form a disc in order to distribute the mung bean stuffing. The ideal way to enjoy their crispy texture is to eat them right after cooking but you can however keep them 1 or 2 days. 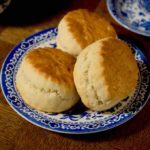 You will just have to reheat them for a few minutes in a hot oven or to quickly fry them in hot oil. 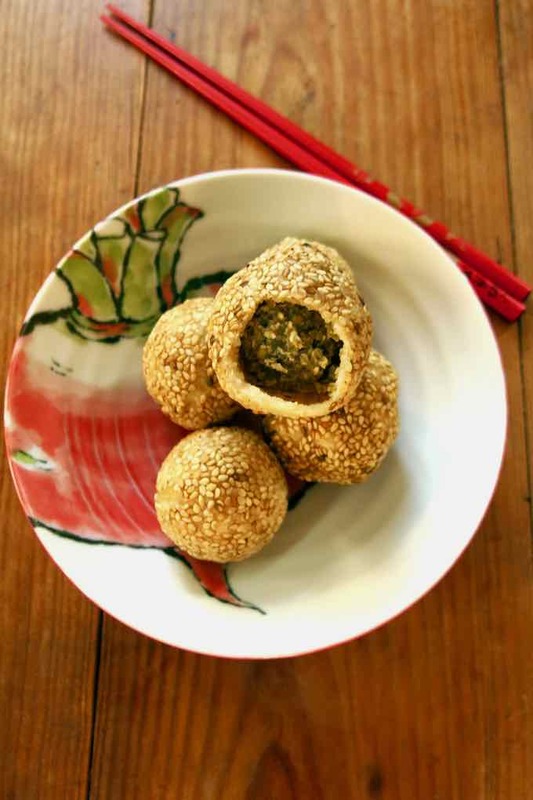 Num kroch (or nom kroch) is a Cambodian dessert consisting of small balls of glutinous rice flour stuffed with mung bean paste that are coated with sesame seeds before being fried. Soak the mung beans for 5 hours then discard the soaking water. Steam the mung beans for 40 minutes (or longer if the consistency of the beans is still stiff). After cooking, mash the mung beans into purée. Add 6 tablespoons of sugar and salt, then form small balls ½ to 1 inch diameter. Set aside. Mix both rice flours in a large bowl. Add the warm water gradually until a smooth and homogeneous dough is formed. 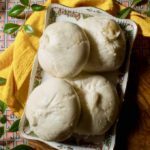 Knead the dough for 3 minutes. Cover the dough with plastic wrap and let it rest for 10 minutes. Then, use the thumbs to flatten the ball, form a small disc and drop a mung bean ball in its center. With your fingers, close the disc of dough and then smooth the edges giving it the shape of a ball. Gently, without pressing, smooth with a circular motion using both palms and form a ball. Renew the operation until all the dough is used. Roll each dumpling generously in the sesame seeds. Place each ball on parchment paper. Heat a large amount of oil in a wok. Fry the balls until golden and crisp.